It’s arguable that the most important piece of furniture in your home or apartment is your couch or sofa. While shopping for an item that’s used everyday by you, your family, guests, and maybe even pets, it’s important to take careful considerations to make sure you’re getting a good value for this essential household item. Because couches seem to be an item that is less popular to sell than chairs, tables, beds, and mattresses, there are a few factors to consider if you’re thinking about saving money by buying used. Value: Our data from all Craigslist posts with the word “couch” or related words tell us that the median price of a used couch or sofa is $250 dollars. 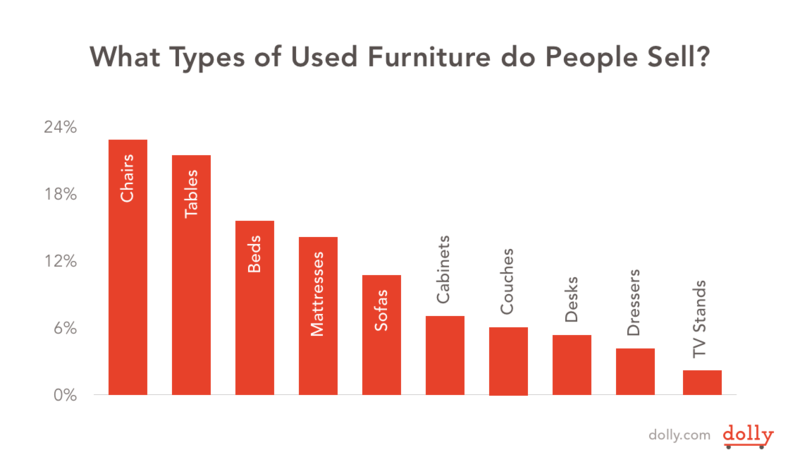 This data accounts for couches of all sizes (from love seats to sectionals), so it suggests that there is potential to score killer deals if you scope out a piece in good condition (see our tips below). Convenience: Furniture shopping can be stressful and time consuming! Traveling to different stores and dealing with overly-persistent salespeople, contemplating or even arguing over colors, styles, and fabrics, and arranging deliveries (unless you shop at Crate & Barrel, then Dolly will take care of that for you!). Selection & Availability: The trade-off to buying used is you have much less selection on color, fabric, and style. Once a used couch is sold, it’s gone. However, if you’re reading our blog, chances are better that you’re looking for ways to save more not ways to spend more, so keep reading for tips on getting the best deal. Remind Yourself: The best way to score on Craigslist is to check it often. Make the furniture classifieds your homepage as soon as you know you’re looking for a new piece of furniture. Cast a Wide Net: Unless you have a very specific piece in mind, search craigslist for not only “couch” and “sofa,” but “loveseat,” “sectional,” “futon,” and “daybed”. These lesser-used words can have fewer people viewing them and you might find an item that you unexpectedly love! Photos: Don’t trust a post with only one or two dark pictures. Watch for red flags (and stains) and ask for several well-lit photos that show the true condition of the entire item. If they don’t provide what you ask, move on. Pictures can be deceiving, so politely asking for quality photos will ensure that you don’t waste your time. Location, Location, Location: Be aware of where the homeowner is living. More afffluent neighborhoods are more likely to have sellers who are refurnishing or remodeling their homes, so there’s huge potential to find beautiful lightly-used furniture at a fraction of the price that it was bought for! Try it before you buy it! This may seem obvious, but before you hand over any cash, sit and lie down on every part of the piece to make sure there aren’t unexpected problems with it. Use any undeclared blemish to lower your price, and don’t hesitate to walk away from the deal if you aren’t happy with the condition. Leave The Benjamin’s In The Bank: Bring only $20’s and $10’s so you can bargain down the price if need be. Act Fast & Ask Questions: Once you’ve found a piece you’re even remotely interested in, contact the seller immediately asking for any info not provided in the description: age, why are they selling it, did they buy it new, blemishes, stains, pets, dimensions etc. Craigslist offers sellers speed and convenience, so the quicker you get the item off of their hands the more you can potentially save. Once you’ve done some digging and bought a sweet couch online, be sure to save your back and let Dolly haul it for you.